Yesterday I went to a very old park in the city. I won’t call it a hunted out park because, really, ALL our parks are hunted out! Anyway, a couple of years ago, a pair of detectorists hit this park with their E-tracs and pulled a number of very cool coins out of there. Needless to say, scores of other detectorists descended upon this park but none repeated the impressive results the two guys with their Minelabs achieved. The park is, of course, very trashy and, as it is very popular today, the trash continues to pile up. I myself have hunted this park a number of times and managed to pull a silver coin now and again. This time however, I took my XP Deus to this park with a very specific protocol in mind. Protocol is a fancy word for what you all do now when detecting. Do you dig a signal or not? The answer to that question depends on your protocol. I specifically wanted to try the spot where the two guys mentioned above found all their coins. 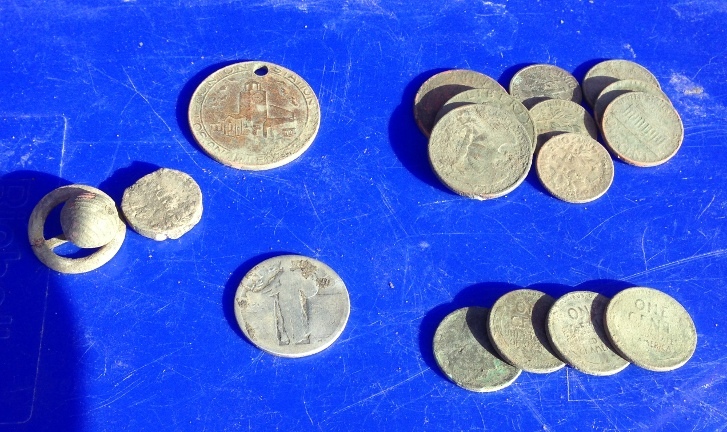 Heck, I was there for one of their hunts and watched as one of them dug up a super cool Seated dime. 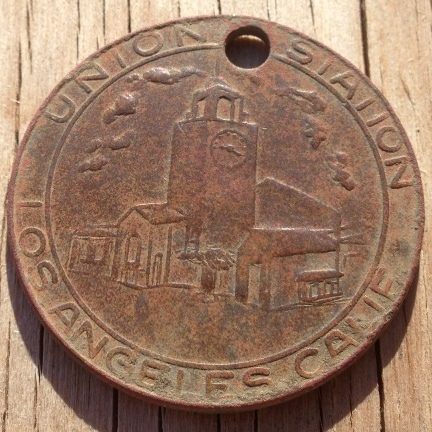 I know they did a very thorough job at that spot but being me, and the reputation of the E-track notwithstanding, I believe there are still many cool coins to be had there. I walked to the very spot where KansasDave found that Seated dime that morning and I began applying my protocol. I had to dig a couple of rusted bottle caps to establish some parameters and then I began to seriously look for treasure. Not long I had a couple of signals that fit the criteria of the Money Making Protocol. 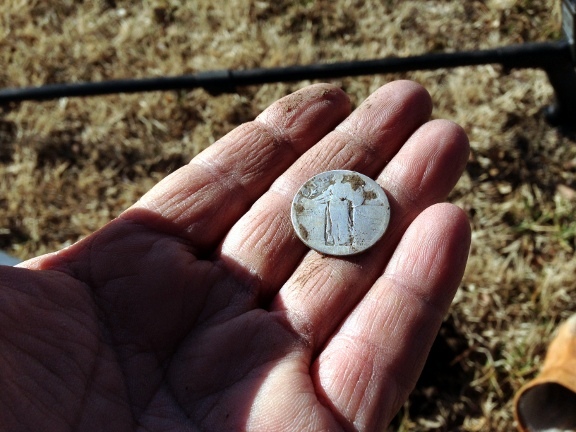 The first coin was a wheat minted in 1919. Cool. Next signal was a wheat from 1918. Next signal turned out to be a very toasted V nickel. I can barely make out the first two numbers of the date: 18xx. 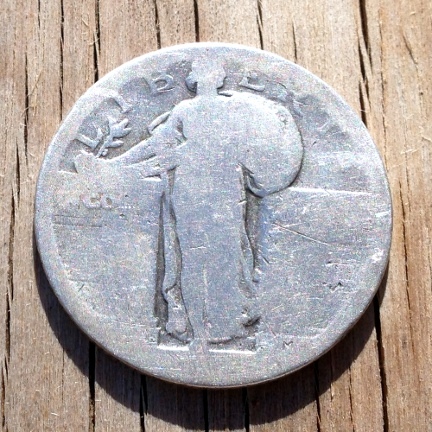 A 1917 Type 1 Standing Liberty Quarter. The last signal of the hunt was a very deep 1964 memorial. Geez! So I think that the Money Maker Protocol is a winner. I wouldn’t apply this protocol to just any park. It is designed for very old parks. Hopefully I will get to hunt a bit more this Fall and Winter. I guess this is going to be a two post day. And I guess I have to do a bit of explaining now. The other day, Tuesday night I think, I read a post on a Deus users forum whereas a well respected and acknowledged guru of the Deus recommended doing a couple of things to the Deus that run counter to popular opinion. What he recommends will kill some of the depth that I have been getting with the Deus lately BUT, the guru contends that being able to unmask the shallow to medium deep targets more than makes up for losing depth. So yesterday, Wednesday, I took Maurice to the park to try these new settings even though, because of the rain, I wasn’t going to dig anything (couldn’t risk getting muddy as I work in an office and I see clients). In no more than 10 minutes I got 7 to 8 signals in a spot I’ve hunted A LOT that were not there before! I was ASTOUNDED. I was BEWILDERED. I was PARSIMONIOUS. (I don’t know what that last word means). I immediately called Steveouke to share this new thing with him. I know he knows the park I was at and I know he knows what a cruel mistress that park can be. Why, if I mined all the iron out of that park I may become a steel magnate. A rusty steel magnate. But I didn’t dig any of the signals so who knows?! Today, although I really didn’t have time to hunt at lunch time, I couldn’t resist the curiosity and I decided to hit the park again. It was cold and cloudy and the wind was probably blowing a good 15Mph but it wasn’t raining. I walked around the spot for a couple of minutes and I couldn’t find any of the signals from yesterday. Argghhhhh!!! Finally, I came upon a shallow signal with a VDI of 92 which at 12KHz on the Deus is a solid silver dime. It wasn’t until I looked at one of the smaller discs on each side of the shiny-edge circle that I saw it was a V nickel! What!!?? This bundle of joy was only 4 inches deep. How did I miss it before? I tell you how: IRON MASKING. I called Stevouke and since he works only a couple of blocks away from this park, he asked that I come over so he could see the old coin sandwich. We ran some hot water over it and we could see that one of the coins on the side was a Buffalo nickel and the other was a V nickel. But what was in the middle? Ta- da! My second Stander of the year. Out of a park that to my knowledge has yielded no coins for a while (except to Maurice and I). Both the Standing Liberty quarter and the Buffalo have no dates. Actually, you can see the last number of the date on the Buffalo and it is a 9. The V nickel is dated 1908. That’s two V nickels out of this park in a week. And I stuck to my guns and pulled silver out of here, which I’ve been telling Stevo I would. Will this new setting hold? 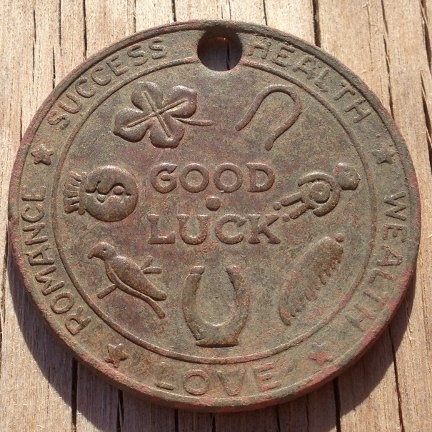 Will I find the other 8 signals that I am sure are coins again? Who invented liquid soap and why? 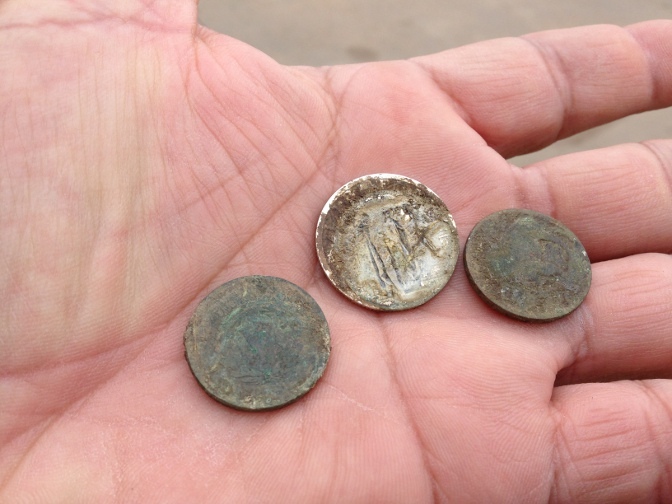 Excited as I was with my finds from yesterday, I decided to hunt early this morning before I had to go to my Karate class. I grabbed Maurice and headed into the cold morning with the aim of finding some deep silver at my deep silver park. Before I ran out of time, I decided to change spots and I am glad I did! This Standing Liberty quarter gave me a rather faint signal. It was all of seven inches deep. I was surprised to find it in fact because I thought a quarter would give a stronger signal at that depth. It is worn and maybe that’s why. It may have also been at an odd angle. You can see faint stars under the eagle on the reverse so it is older than 1916. 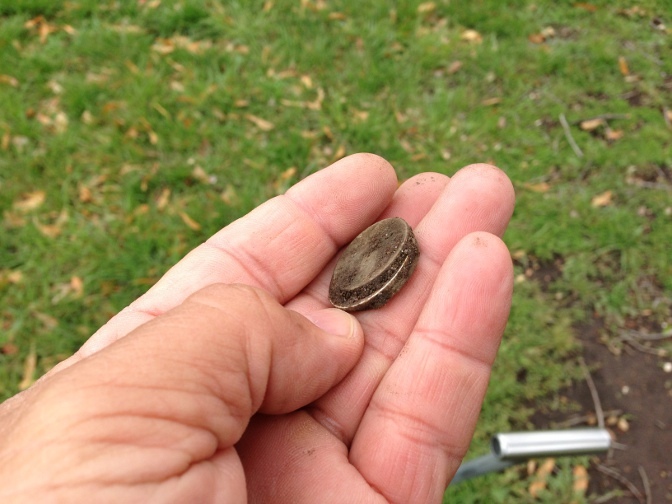 This is the very first silver quarter I have found at this park in over a year and a half of hunting it. This is also my first silver quarter of 2013 and my first SLQ of 2013. It was not a bad morning hunt.